The Yak-7DI experimental aircraft was the prototype of the Yak-9, one of the most numerous fighters in the Soviet Air Force during WWII. The fighter was designed in mid 1942 by A Yakovlev Design Bureau. 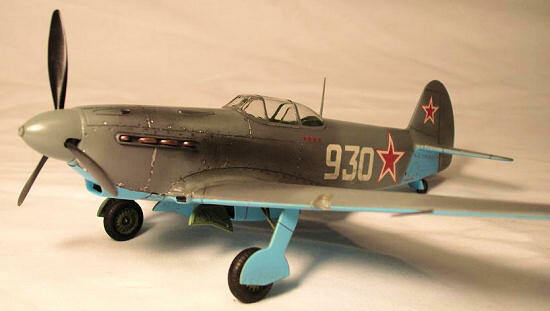 The Yak-7DI/Yak-9 possessed good flight characteristics and was easy in service and maintenance. From the fall of 1942 Yak-7DI/Yak-9 fighters were in action on all fronts of the Soviet German war. Yak-7DI/Yak-9 fighters were in service with the Soviet Air Force and Free French “Normandia-Neman” regiment. During 1942-1945 the fighter was produced in great numbers. Many Soviet aces fought at Yak-9 controls with Nazis. Among them were distinguished pilots twice Hero of the Soviet Union A. Vorozheikin (52 victories), A. Koldunov (46 victories), and French pilot, Hero of the Soviet Union M. Albert (23 victories). In total 15,470 Yak-7DI/Yak-9 fighters in 15 types and modifications were built. A few years ago while attending WWII Weekend at the Mid-Atlantic Air Museum in Reading, PA, I had my first encounter with a Yak fighter. Upon hearing the distinctive sound of a V-12 engine, I glanced up to see a diminutive aircraft on final approach. With the radiator located under the fuselage and smooth front cowling, at first I mistakenly identified it as a Mustang. As it neared the field it became obvious that it was no P-51. I must have snapped 20 photos as the Yak-3 taxied in. I was awed by the simple beauty of the plane and its two tone gray camo uppers and blue underbelly highlighted by red stars. I followed the Yak to its parking spot where I was able to talk to the pilot for some time. This Yak-3 was re-produced in Russia in the 1990's. This plane was fitted with an Allison V-12 due to parts availability and evidently raced at Reno. From the flying display he put on later in the day I'm sure the Yak's were formidable. I have never seen a warbird aerobatted like that! Once I had met the Yak in person, I was determined to build a model of one. When I saw the ICM Yak-7DI/Yak-9 in a local hobby shop I grabbed it immediately. Other than the smooth cowl of the Yak-3, the Yak-7DI/Yak-9 looks similar. 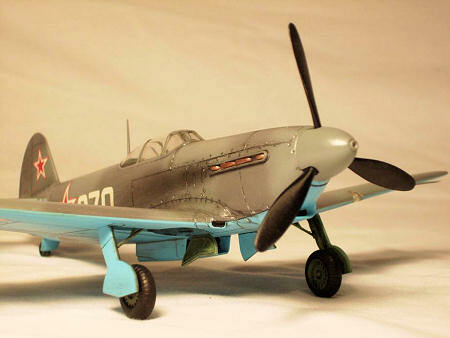 As one of the most produced fighters in history, the Yaks have been ill served by model companies until the more recent releases from ICM, Eduard & Accurate Miniatures. This kit is made of gray plastic with a slightly pebbly surface texture in spots and plenty of mold release agent. On the plus side, there is a basic Klimov engine, some very fine interior framing and other details, and separate control surfaces. On the minus side, the clear parts are awful, the canopy being too thick and the framing so heavy it looks as if it came off of an armor kit. The propeller is also very odd, looking like no other prop I've ever seen. 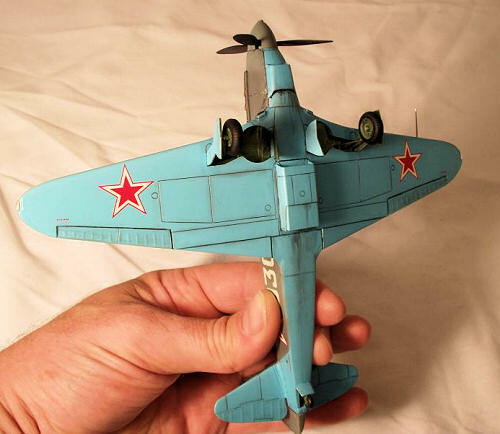 The shape of the kit is accurate for a Yak-7DI or early Yak-9. I started this build with the engine. I quickly decided to do a closed-up bird due to the lack of engine detail and difficulty getting everything to fit. On to the interior. Once everything was painted and assembled, I gave it a wash using a mix of soapy water & black paint. I then dry-brushed the interior with Testors silver (oil-based). 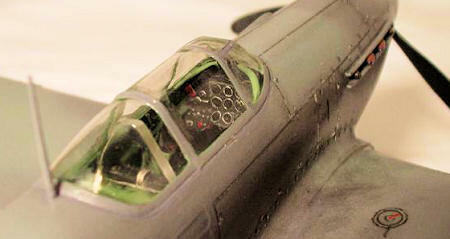 The instrument panel was painted flat black, dry brushed, and then I applied Future to the dial faces. Finally, I attached some pre-painted Eduard belts with white glue and glued the fuselage together. The rest of the airframe built easily but needed putty in a few spots (wing roots & engine cowling). I did not pose the control surfaces on this one. I did use some sprue to spread the fuselage a little to match the upper cowling. Now for the canopy! If you are comfortable with vacuformed canopies I would recommend using one. I decided to doctor up the stock canopy. I scraped off the framing with a #11 X-acto blade, sanded and polished it smooth with 2000 grit wet-or-dry sand paper and a used dryer sheet., and dipped it in future 3 times. I then attached the canopy to the plane with white glue and masked it with Tamiya tape. Though a vast improvement over the stock framing, the canopy is still too thick and distorts the interior when viewed from certain angles. The only other area of difficulty I had was painting the wheels/tires. They are one piece and there is no line to show where the wheel stops and the tire starts. I made my best guess. They aren't perfect but look acceptable after a wash and dry-brush session. I wanted to do a similar color scheme to the plane I had seen at the air show. I chose to use the kit decals to depict a Yak-7DI of the 967 IAP (Fighter Regiment), 1st Pribaltijsky Front, March 1943. All paints used in this build are Polly Scale and Tamiya acrylics. I used Russian underside blue for the lower portion of the plane. Once this was masked I free handed the upper camo scheme. At this point, I applied pastel weathering to the panel lines and then sealed everything with a coat of future. I used the kit decals for this one with no problems. The clear area around the decals was trimmed with a new X-acto blade. Though a bit “sticky” the decals went down fine. I had to apply water to the area where the decal was to go and float the decal into place. Once the decals were in place and almost dry, I brushed on some Champ setting solution and I’m pleased with the results. After weathering the decals, I gave the plane a final semi-gloss coat of future to represent the hard wearing wax coating applied to most Russian planes of WWII. The landing gear and other final bits were added at this time. I really liked the petite radio mast and pitot tube. I have broken the antenna off several times now but I still like the look. I did not like the look of the kit exhaust either and replaced them with spares from an Accurate Miniatures Yak-1. Now for the prop. I'm afraid that there is no hope for the kit-supplied part. I replaced mine with a spare from a 1/48th Tamiya Dinah. It may not be 100% correct but to my eyes it looks 100% better and is close in shape to the prop on the Accurate Miniatures Yak-1. I really like the way this kit turned out. I thank ICM for giving us an injected kit of this great looking plane. Visually, only the prop and canopy prevent this from being really nice out of the box. I'm glad I made the effort to correct them. The lack of locator pins on this kit should not pose any real issues to a modeler. I would recommend this kit to anyone except the bare beginner. I'm still waiting for an accurate late model Yak-9.